Sister John Maureen Backenstos, SNJM departed this life on December 14, 2017 at Marie Rose Center, Mary’s Woods at Marylhurst in Lake Oswego, Oregon. Sister John Maureen had celebrated 95 years of life and 73 years of religious profession. Sister John Maureen Backenstos (Margaret “Peggy Jean” Backenstos), age 95, died at the Marie-Rose Center at Mary’s Woods at Marylhurst in Lake Oswego, December 14, 2017. A member of the Sister of the Holy Names of Jesus and Mary for 73 years, her funeral will be held at 11 a.m., January 11, 2018, in the Chapel of the Holy Names, Lake Oswego. Daughter of James and Patience Whitaker Backenstos, Peggy Jean grew up in the Portland area. After graduating from St. Mary’s Academy, she entered the Sisters of the Holy Names at Marylhurst in 1942 and received the religious name Sister John Maureen. She had a long career in elementary education in Holy Names schools in Portland, Salem, St. Paul, Lake Oswego, Medford, Seattle and Eugene before moving to high school where she taught at Marist in Eugene. During these years she completed a bachelor’s degree in education from Marylhurst College and a master’s degree in English from the University of Portland. She later spent 35 years in McKenzie Bridge, Oregon, ministering to spiritual and temporal needs of the people of the area. 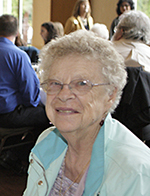 An active member of the McKenzie River community, Sister John was a substitute teacher, a parish minister, a volunteer firefighter and a frequent contributor to retreats at St. Benedict’s Retreat Center in Blue River. She also organized a local food pantry with the St. Vincent de Paul Society, which continues to this day as the McKenzie River Food Bank. Sister John Maureen was an active force for social justice. Among other things she participated several times in the annual demonstration at Fort Benning, Georgia, calling for closure of the School of the Americas. One of her proudest moments was her arrest for crossing the line at Fort Benning. All her life she had a close affinity with the out-of-doors. She was an avid hiker and camper, having walked parts of the Pacific Crest Trail. She was a great traveler, chaperoning several trips to Europe as well as making personal trips to Asia and Africa. She was a talented photographer, capturing on film some of the most scenic areas of the Pacific Northwest. From an early age, she honed her skills as a writer and a poet and in 2013 published a book of poems entitled Heart and Soul: Selections of Poetry. Sister John Maureen is survived by niece, Jeanie Blackburn; cousin, Jim Backenstos; and members of her religious community. Remembrances may be made to the Sister John M. Backenstos Scholarship Fund, Marist High School Foundation, 1900 Kingsley Road, Eugene, OR, 97401, or to the Sisters of the Holy Names, P.O. Box 398, Marylhurst, OR 97036 or online at www.snjmusontario.org/donate.